Remember our post Abandoned Underwater Prison, Estonia? 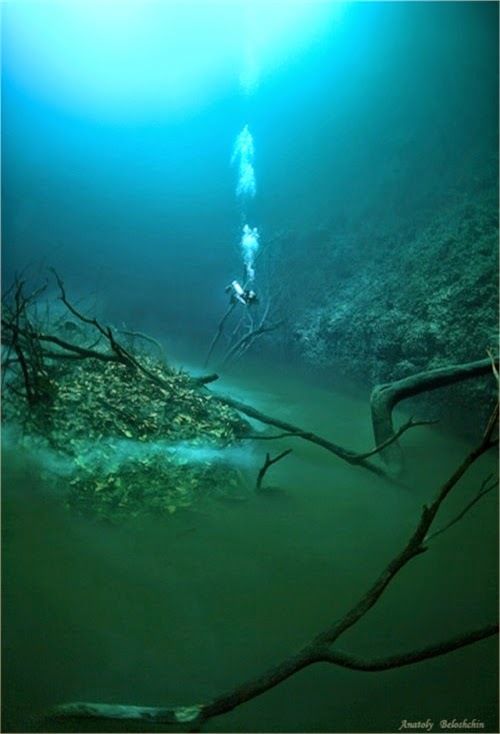 The mystical underwater river, known as Cenote Angelita, is situated on the southeastern part of Mexico in the Yucatan Peninsula, near an ancient Mayan city called Tulum. The peninsula separates the Gulf of Mexico and the Caribbean Sea. Angelita means “little angel” in Spanish. 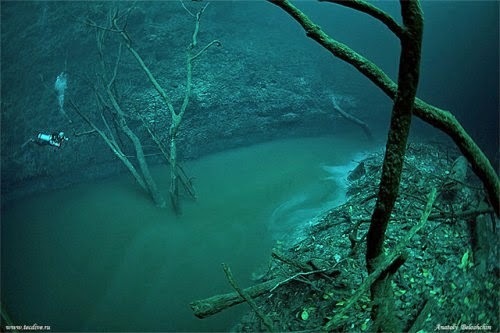 A cenote denotes a sinkhole where a rock layer has collapsed and revealed groundwater underneath as well as gathered rainwater over a long period of time. 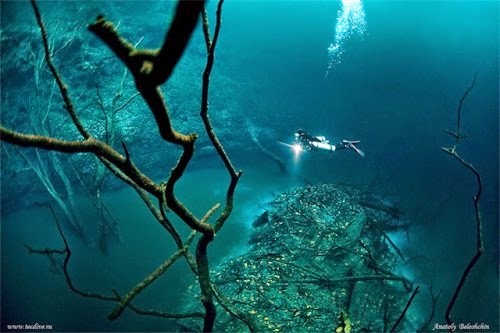 The Cenote Angelita looks like a cavern where the bedrock has collapsed very long ago and it is exceptional in the sense that it has trapped salt water from the sea and fresh water from the rain within an expanse measuring fifty-five meters deep. A person scuba diving will at first notice completely clear water with no visible impurities or impediments, such as the air we breathe in. 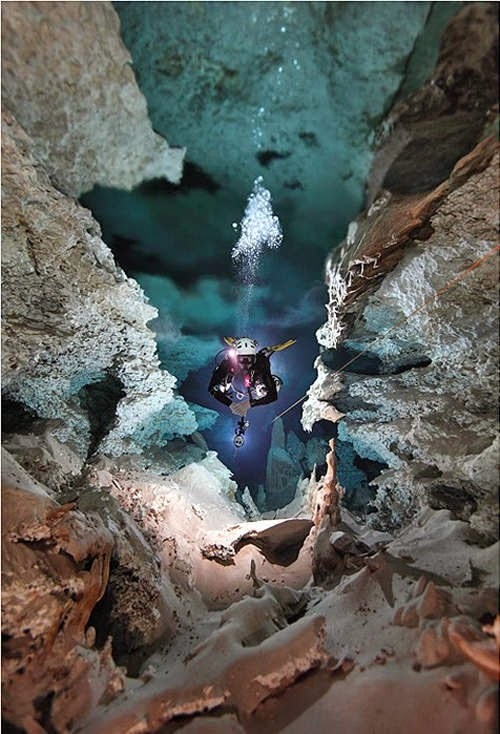 The sight that greets the individual diving further down is even more spectacular. 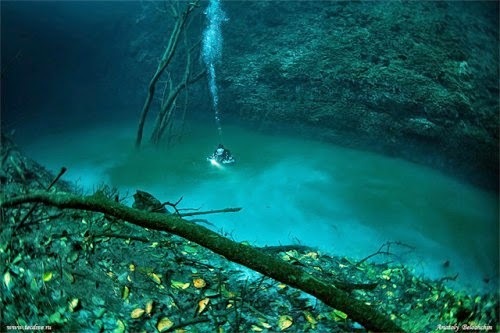 A greenish mist-like river flows along ninety feet below the surface of the water, complete with trees and debris in its midst. 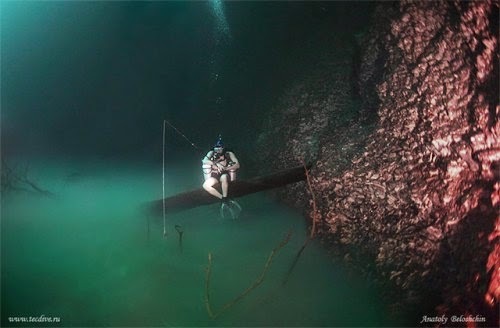 The sight is almost ethereal, out of a horror movie and a person can feel disoriented thinking that he is above water and witnessing such a scene. The fact is that this phenomenon is very much real and even spooky for some, while drawing people into its mysterious depths. 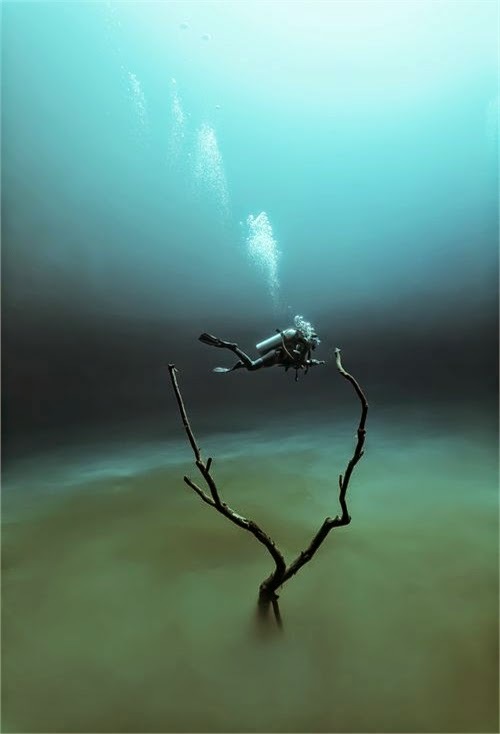 You will know without a shadow of a doubt that you have indeed encountered the mysterious and haunting underwater river of Mexico. The enthralling spectacle is not actually a river in the literal meaning of the word but is instead an illusion painted by the cave’s water composition. The difference in density of the salt water and fresh water causes the fresh water to drift to constitute the top layer while the salt water sinks to be the bottom layer. The boundary between the two layers comprises of a thin layer where there is a sharp change in salinity. It appears as a cloud due to the formation of hydrogen sulfate through the breakdown of organic matter in an oxygen deprived environment. The thin interface made up of hydrogen sulfate creates a remarkable contrast with the clear water above and appears to be moving in a specific direction, thus projecting the view of a river flowing underwater. Moreover, the presence of branches and trees in the bottom layer further reinforces the image of a river. 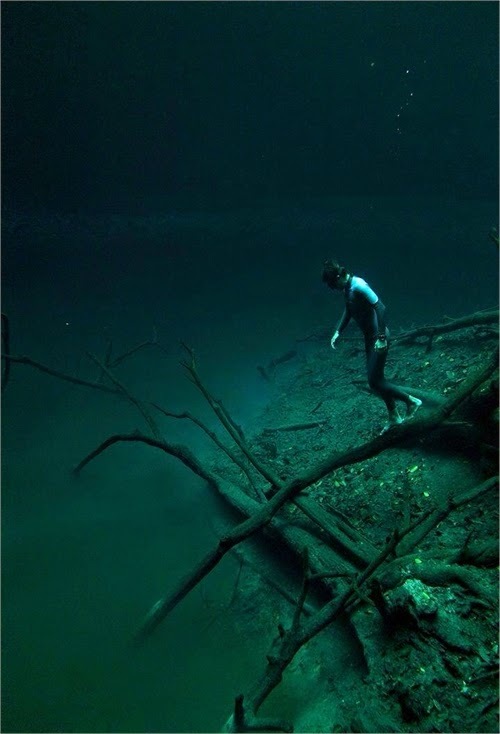 Cenotes are of utmost archeological importance as it was customary in the rites and rituals of the Mayan people to throw precious objects into them. 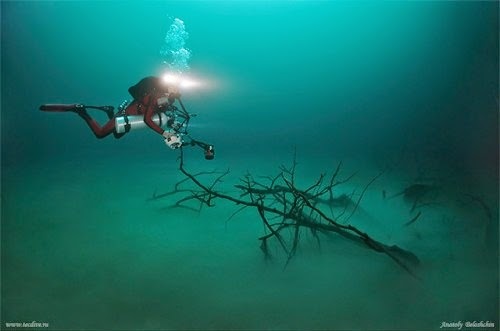 Those objects sank to the bottom of the cenotes and remained in good states which allowed archeologists to further their study of the Mayan civilization by examining prized artifacts and relics. 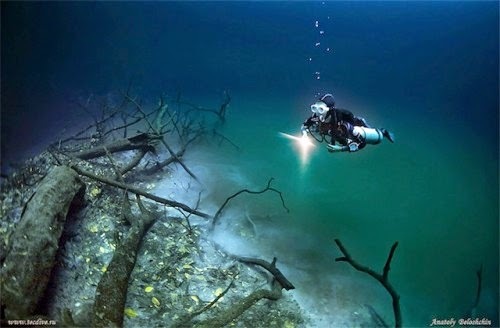 The mystical underwater river in Mexico is indeed a worthwhile trip for those in search of unique and mesmerizing experiences. However a person wanting to attempt a dive into the river must be a qualified scuba diver with at least 20 dives to his certification. It is indeed an out-of-this-world adventure which will stay with you for a very long time.